The hardest and sometimes most frustrating part of aging is not being able to do the things you used to do. I frequently see patients who have coped with joint pain and stiffness for years before finally coming to see me. But you shouldn’t wait until your joint pain is so bad that you’re no longer able enjoy your life. Joint replacement surgery is the last line of treatment for severe joint pain, but with today’s technology and advanced materials, artificial joints are lasting longer and longer. The techniques and technology used in joint replacement surgery have improved over time, and today’s surgical techniques are less invasive and more precise. One modern piece of technology is a tool for computer-assisted surgery for knee replacements called Exactech GPS. In computer-assisted surgery for knee replacements, a computer uses sensory inputs combined with calculations to determine where the center of your knee is to make a personalized image of your knee. This personalized image creates a more precise alignment, which means less pain and less blood loss. Patients who opt for computer-assisted surgery have better function six weeks after surgery and fewer instances of joint replacement failure in the long term. Any patient who’s a good candidate for a knee replacement is a good candidate for computer-assisted surgery. 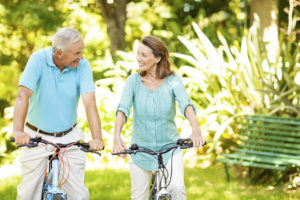 It’s normal to be worried about the recovery and pain of joint replacement surgery, but the precise alignment of computer-assisted knee replacement means you’ll have less pain and swelling, and better function so you can return to enjoying your life. Jeffrey Ginther, MD, FACS, has performed more than 600 computer-assisted knee replacements in the past six years. Additionally, he is the only provider in Indiana that uses Exactech GPS for computer-assisted surgery. To learn more or schedule an appointment, call Riverview Orthopedics & Sports Medicine at 317.770.4100.